I adore the packaging. Compact, light, simple, and pretty. Why can't U.S. drugstore brands do this? I literally gasped when I opened the blush. The perfectly smooth surface looks even holy, but only to be desecrated.. 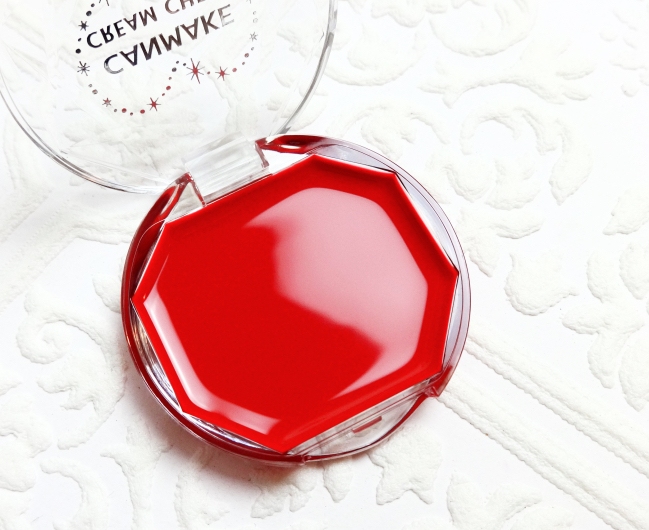 Many describe Clear Red Heart (CL01) as a perfect neutral red and I have to agree. The color is vivid but thanks to its unique translucency and gel-like texture it seamlessly blends into something very natural and youthful. I used to think cream blushes didn't last as long but I find the Canmake Clear Red Heart stays all day on me despite of the slightly dewy finish (What have I been missing?!). The color deepens a bit a few hours later but still maintains the neutral tones. I am even more enamored by the Jelly Stick Gloss packaging! All plastic but it is so well made from the frosted cap down to those light pink lace patterns. It feels compact and lightweight but there is no flimsy feel about this. 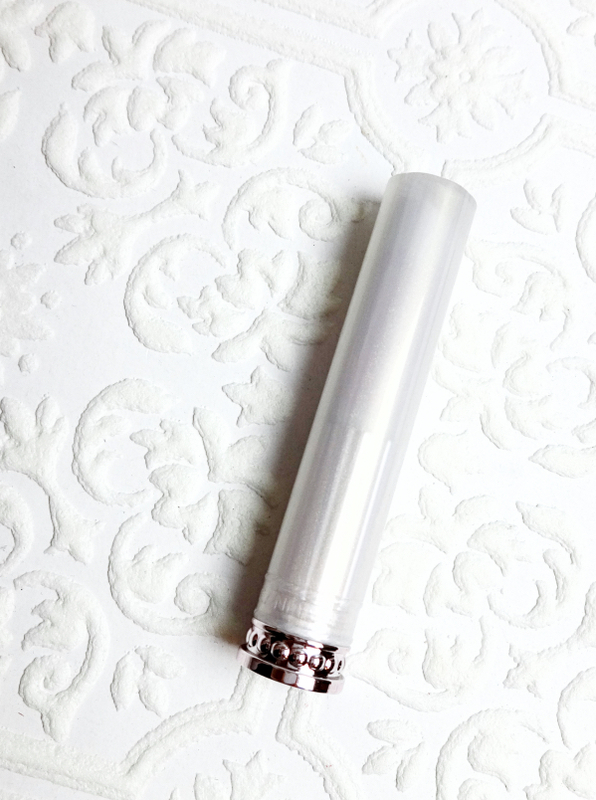 Plus the sheer easygoing color that requires no mirror instantly elevates Jelly Stick Gloss to "a cosmetic bag lippie" status. The name "Jelly Stick Gloss" says everything. It has the distinctly soft and squishy texture and quite a glossy finish. 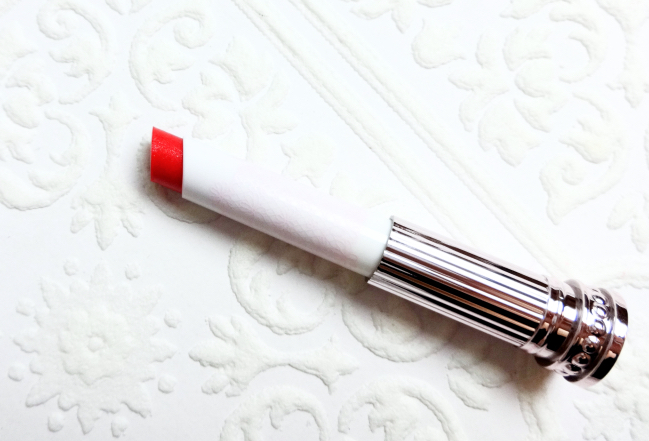 It is not long lasting at all (naturally) but feels hydrating and even pampering on the lips. I do not detect any masking scent. Pure Strawberry (02) is a great complement to Clear Red Heart. It is a very sheer neutral red with sparse silver shimmer that isn't much visible once applied. For some reason this swatch came out much pinker, but it is quite neutral in real life. Hopefully you can still see the finish and the color payoffs. Here is an overall look with Clear Red Heart and Pure Strawberry. Here I am aiming for a monochrome look except for the light brown eyeshadow that I used for some definition to the eyes. 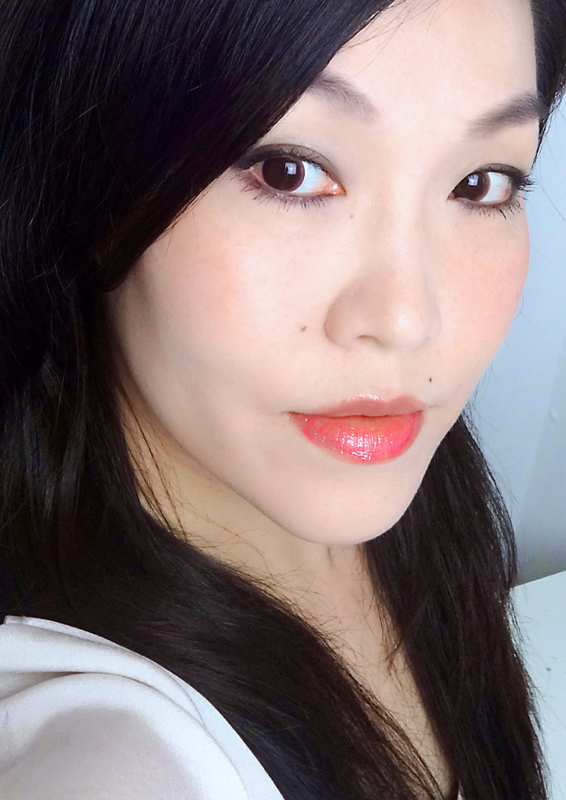 I love how these sheer red colors work seamlessly together to create a clean minimal face with a subtle healthy glow. I must credit Mina of Citrine's Blog. 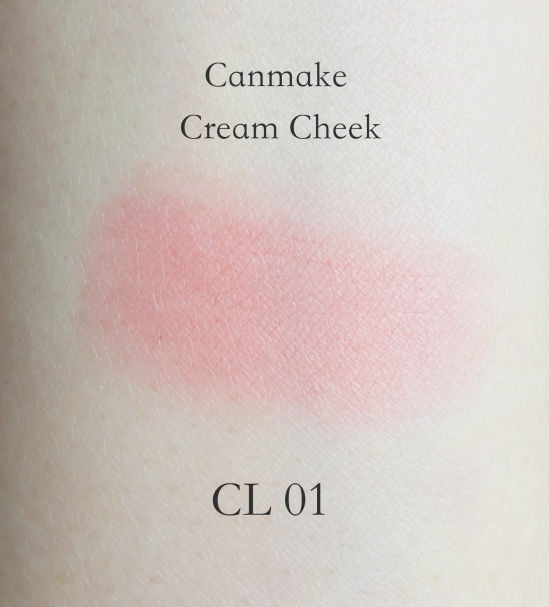 Sure, I was always curious about Canmake Cream Cheeks since every blogger seemed to love them, but it was her reviews that finally enabled me. Suddenly I am all about cream blush. After watching a Lisa Eldridge's video recently, I even managed to score some of the discontinued Revlon cream blushes (still available online) which are excellent quality, but I think I prefer the Canmake Cream Cheek clear types for a naturally fresh effect. 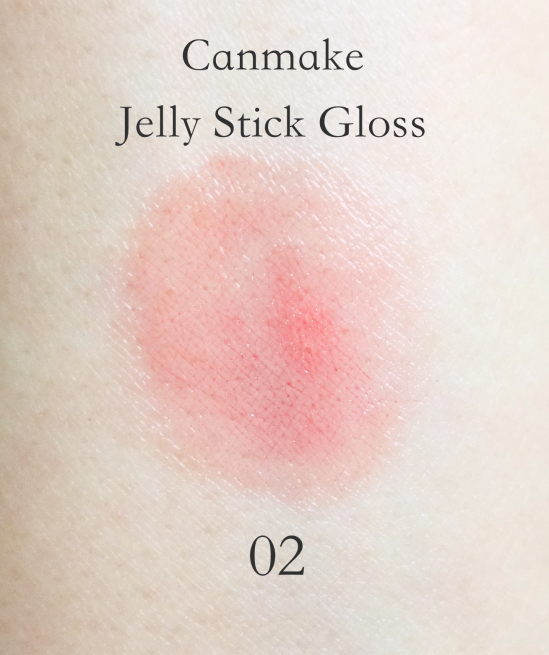 Jelly Stick Gloss is available only in 4 shades and I can't say they are all that unique, but I'd definitely grab a few more in the future. Deep down I know they are just glossy tinted lip balms, but when they are portrayed as "gloss sticks", everything changes. Hey Lena, oh that cream blush! 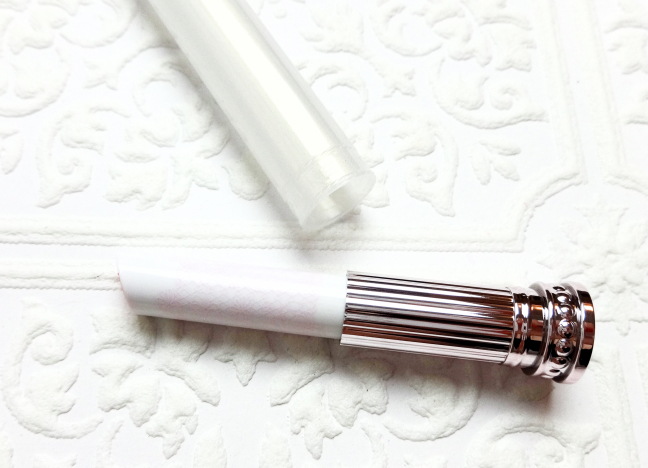 It looks so natural on you, and the finish is pretty! I'm glad to hear it wears well. I would never have guessed because the finish is quite dewy! The "gloss stick" looks great as well. I like your logic: when they call it a gloss stick, everything changes. I thought the same as you, and I dislike using fingertips to apply makeup so cream blush was never my fave. I think it is mostly the translucent quality that allows me to blend the color in nicely, but the finish is really beautiful. Wait, are we synched or something. I have been hoarding cream blush as well that's why I have been neglecting my cream cheeks...the Josie maran argan cream oil (a cherry one and endless guava)are really nice if you don't mind the extra dose of dew...I also want to buy the visee cheek/lip cream as they are less than 8 bucks on rakuten...but I need a little break for now since I went a little crazy on brushes. Oh no, you're tempting me, again..?! ;D I've been curious about the Josie Maran blush. The colors are gorgeous! I'm also looking at Cream Cheek Clear Ruby Cherry. LOVE it! That blush is amazing on you! So pretty! I'm all about cream blush these days. I hardly wear powders anymore. 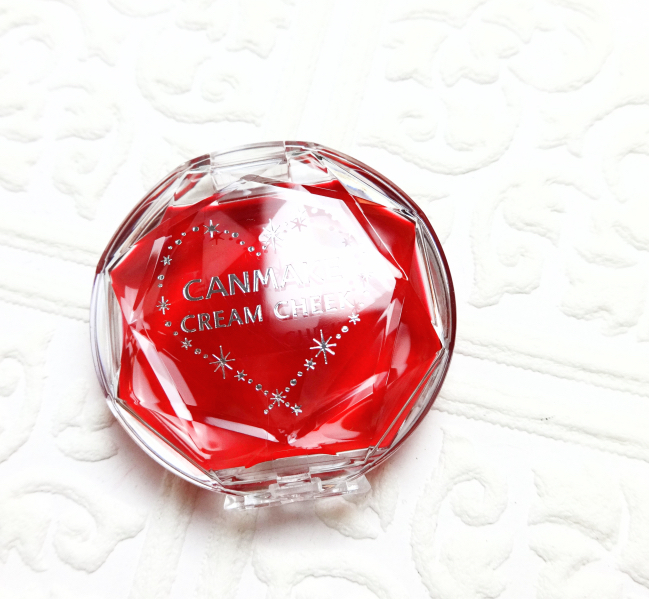 Well, I need it in about 7 years after I polish off the current cream blush stash, lol. I love love love how healthy and glowy a subtle red tint can look. Both products look so pretty! Oh, I though you had one already. That situation should be fixed! Oh so glad to see the finish of that blush on you! These have been sold at my drugstores for years and years now and I just skip them all the time because of my natural love for powder blushes instead! Love that translucent jelly finish though, it's super fresh and beautiful! I think Cream Cheeks are definitely worth checking out especially if you have an easy access to them! Is it my computer screen, or does it actually look coral on you? The gloss stick that is? Never mind that, because the look is gorgeous! I've been wearing my Canmake cream cheek too. I love their pink (CL02) which I think will suit you, and I've been using lots of CL05 which is a milky apricot. It gives a very youthful look, that color. I have CL01 as well, and need to use that too. These drugstore cream blushes cost so much more here though. It's about USD15 a blush, sold at Sasa. If you need me to get them for you, give me a DM on Twitter. I think shipping to the US (registered air mail) is about USD10. To be honest, I didn't do a good job taking pictures for this post. For some reason, they were very shifty. In real life, I think both colors are quite neutral maybe leaning a tiny bit warm? Thank you, Brenda! :) Try Amazon.com as well. I guess many of them do business on both platforms but I find better prices on Amazon. Also the Vichy eye serum is great because I don't have to use two different products for the eye area and my lashes. Quite nice! Gah, so pretty! If they were more readily available here (i.e., I could just throw them into a cart at drugstore.com or something), I'd probably get one, but as it is, too much effort...hahaha. I have also been loving cream blushes lately, though! That's all I have been wearing. I love that cream blush! I picked up the same shade when I was in Japan, I wish I had bought more! They're so easy to blend, I love using them on the go. I know, right? If you look at Japanese drugstore packagings, they are not made of expensive materials or anything. I am not into super girly or over the top designs (e.g. Jill Stuart makeup), either. This canmake stuff is simple, pretty, and functional. LOVE. The packaging of both products is so princessy and pretty! The formula of the cream blush looks perfect! I soo want to go to japan one day to splurge on beauty! How did you find the courage to swatch that cream blush? It's TOO pristine to use! But man, what a gorgeous, gorgeous color, though. I love the dewy, translucent finish, too! 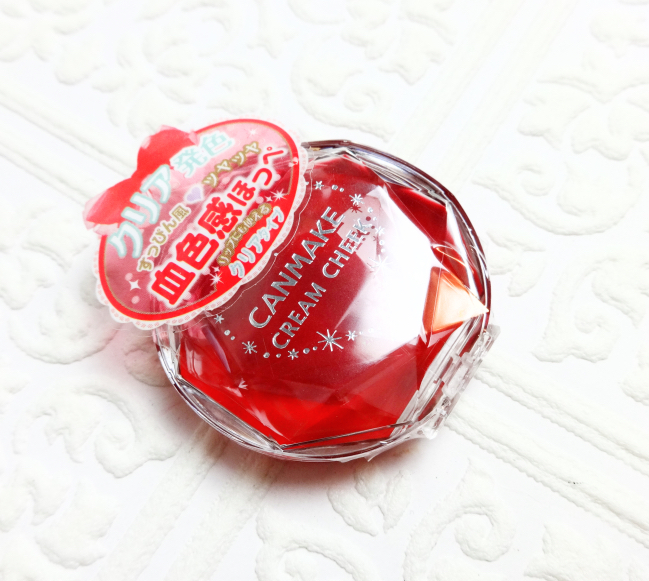 Canmake is widely available here so I'll see if I can grab one or two to test!